Leading independent oil company Phoenix Petroleum helped schools get ready for the new school year in the recent Brigada Eskwela. Team Phoenix employees joined the school clean-up drive and cleaned and repainted classrooms, chairs, and tables in seven of its adopted schools. The company also donated over P190,000 worth of paint and school materials to 16 public schools nationwide. 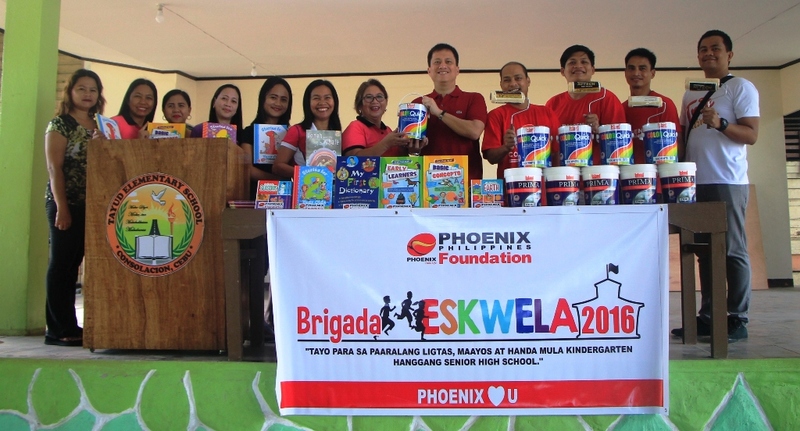 For six years now, Phoenix Petroleum has been an active partner of its adopted schools and the Department of Education in the nationwide Brigada Eskwela program. This is part of the company’s commitment to support its partner communities through various programs in education, environment, health, and outreach. Team Phoenix in Luzon helped their adopted schools Salong Elementary School and Lumbang Calzada Elementary School in Calaca, Batangas in cleaning and repainting of classrooms on June 4, 2016. Paints, paint brushes, and school materials were also donated to Rafael Palma Elementary School in Pasay City. Phoenix employees in Visayas participated in the clean-up program at Tayud Elementary School in Liloan, Cebu on May 28, 2016, and Tabucan Elementary School in Iloilo City on May 30, 2016. Phoenix Petroleum, led by Vice President for External Affairs, Business Development, and Security Atty. Raymond T. Zorrilla, also donated boxes of paint, paint brushes, and other school materials to Maguikay Elementary School, Pasil Elementary School, and Sawang Calero Elementary School on May 26, 2016. Team Phoenix in Mindanao cleaned and repainted classrooms at Kauswagan Central School in Cagayan de Oro City on June 2, 2016; Vicente Hizon Elementary School and Lapu-lapu Elementary School in Davao City, and Talisayan Elementary School in Zamboanga City on June 4, 2016. Phoenix Petroleum also donated boxes of paint, paint brushes, and other school materials to Davao City Special Education School, San Roque Elementary School, Doña Asuncion Hizon Elementary School, and F. Bangoy Elementary School in Davao City.